Come April. I will be one of hundreds of other bloggers posting our way through the alphabet in the annual month-long Blogging from A-to-Z challenge. Given my penchant for creating abecedariums, how can I resist? Today we’ve been encouraged to “reveal our theme” – what we’ll be spending the month of April writing about. Finally, after a couple of false starts, it feels like exactly the right time to pursue the series I’ve wanted to write about for a while – pronoia, peace, and quiety. Pronoia is the philosophy extolling the belief that the universe is conspiring to shower us all with blessings; quiety means calmness and serenity; and peace of course needs no definition. I often say I like to keep my feet on the joy trail, yet I’m no Pollyanna – I know we all have our share of challenges and wobbles, sadness and hard, both personally and collectively. But I whole-heartedly believe we’re responsible for how we meet the world and the energy we put out there. And in this time of so much fear-mongering, separation consciousness, and service-to-self in the collective, I think it’s especially important we all do our best to contribute to making the world a kinder, gentler, more compassionate place for all beings. I think that’s why I’m such a big fan of pronoia – a term coined by astrologer Rob Brezsny. He wrote a book entitled Pronoia Is the Antidote for Paranoia: How the Whole World is Conspiring to Shower You with Blessings. I also believe we all need to be strong advocates for peace. Our services, our light, our love is very much needed. Equally important is our commitment to not add to the morass, the abjection, the overall craziness in the world when we’re in a position to offer something more uplifting and more unifying. I’m also a great lover of words, and one I particularly love is the word quiety. People often mistake it – reading quietly instead of quiety, and that makes me smile gently. Quiety means quietness, calmness, peace, tranquility. It’s exactly the kind of word that encourages you to slow down and read it correctly. I embrace all the things it means, and want more of quiety in our world as well. So for the month of April I’m going to turn my blog into an oasis of pronoia, peace and quiety. I’ll be sharing all manner of things that delight me, feel good, and contribute joy, beauty, and/or serenity. I’ll be adding a little extra layer of challenge to this challenge as well. I’m going to base my entries on unusual words that delight me. Sounds like fun doesn’t it? I certainly hope you’ll hang out with me in April while I’m promoting pronoia, quiety and peace. And perhaps you’ll be playing in the challenge as well. I look forward to reading my way through the alphabet on an endless variety of topics via hundreds of bloggers. I hope you’ll be one of them. Sounds like a great idea Hilary – I’ll keep the garden chairs waiting. Looking forward to a month of great reading and visiting. Yay, Deborah, so glad you are participating! Yes, Pronoia, Peace and Quiety. I love your quirky words! I’m playing again too. Hope I haven’t set myself too big a challenge! Thanks Janet. Here’s to another whirlwind and fun April. I could do with some more helpings of quiety for sure. Count me in! With the delightful craziness April’s challenge inevitably brings, I think we’ll all be needing doses of serenity to dip into. Have fun with the challenge, and thanks for stopping by. I’ve come to think of April as one of my favorite months – I always learn so many new things on such a variety of topics. Agreed. And wishing you a wonderful challenge as well. Just the theme that’s needed at the moment! Looking forward to finding out what words you choose. To quote your words: “I also believe we all need to be strong advocates for peace. Our services, our light, our love is very much needed.” I totally agree. There’s far too much negativity in the world. And it seems to be spiralling downwards at an alarming rate! What a delight we’re a bit of kindreds in our theme Michelle. Have a wonderful April and I’ll be by to read your posts. Pronoia – a word I have never heard of. Quiety – another word I have never heard of. I will look forward to a few minutes of peace and calmness, something too many of us don’t have enough of. 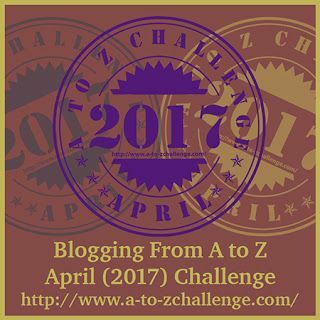 There are always so many fun things to learn and experience in the A-to-Z challenge. Thanks for stopping by Alana, and I look forward to visiting your memories in April. Thanks J R. I think we’re in for a wonderful April – let the fun begin! Fantastic theme! I think the idea that the universe wants to shower us with good things is great, and if we all viewed it this way, maybe we could learn to see the good more! I truly believe that keeping our eyes and hearts open is the best way to navigate in this world. Hope you have a wonderful April, and I’ll be looking to you for motivation. This sounds perfect – such a lovely restful series to offset some of the more ‘rambunctious’ ones that I’ll be delving into. Looking forward to sharing the Challenge with you Debbie! April is always a bit of a frenetic rollercoaster ride isn’t it? So it delights me to think I might be a bit of calm oasis to indulge in. Looking forward to catching up with you during the challenge Leanne – and have fun. I think what one looks for is often what they find. Start driving a model of car that is new to you and suddenly you see them everywhere. Mindset alone may not be able to make certain things happen for you or to you, but you’ll notice more things that are in tune with the bent of you mind. Perhaps you’ll enrich all of our vocabularies with you theme! Yes Barbara I share your belief that what we resonate with is what we keep our eyes open for. This sounds really lovely. We can never have too much joy, peace, beauty in the world. And, right now, I think we all need a lot more of it. Looking forward to your posts. Good luck with the challenge! I’m doubly impressed you’re tackling a double challenge Shalini and posting from both your blogs. How fun! Good luck and stop by any time you need a little calm reprieve. Thanks Susan. I love knowing we’re all ambassadors of pronoia, peace and quiety in our own right – and that we can both encourage one another and lean into each other when needed. Pronoia, thanks for introducing this beautiful concept and curious word. I will be fascinated to learn more! I’m really looking forward to your posts as well Stephanie. We’re in for a fun, if crazily busy, April I think. I love anything with unusual words and will be back come April. Thanks. And I certainly look forward to your series as well. Have a wonderful April! Hello from A to Z! Thank you for visiting my blog. I hope you’ll return to see my posts. Meanwhile, a little quiety is just what I need. I’m trying to be a more positive person and it sounds like your posts will be just the ticket! Indeed I’ll return to read your posts Julie. Good luck with the positivity and have fun with the challenge. Bookmarking your site–will be back for some peace, quiety and Pronia! I love it!!! Thanks for visiting me as well. Thanks Gail. I’m certain we’re in for a fabulous April. Have fun with the challenge and I’ll be seeing you then. HI Deborah, I’ve never encountered the words, pronoia and quiety, before. I look forward to being enlightened. I like your style of writing, and agree that, in a manner of speaking, we reap what we sow. As a kindred word lover I look forward to your challenge posts as well Cynthia. Have a fun April! Sounds interesting. Welcome to the A to Z Challenge. Have a great April. Thanks Arlee – and I appreciate you stopping by. No doubt it will be a crazy but fun April for all participants – I’m so glad we get to play again this year. This sounds like a lovely theme. I think we could all do with a little more pronoia, peace and quiety in our lives. Thanks Cait. Wishing you luck with the challenge as well – have fun! Early birthday wishes Yolanda. I’m looking forward to your posts as well. We’re in for a fun April I expect. Dropping by to say hello from A to Z. Thanks Anna. Wishing you all the best with the challenge! This sounds amazing. I love learning new words (and I hope you’ll find a few I don’t know) and some pronoia, peace, and quiety sounds like just want the rest of us need during the challenge and in the word right now. Thanks for stopping by my theme reveal! Thanks for stopping by Heather. I’m looking forward to your posts as well. Let the April fun begin! Sounds like a fascinating theme, I think we can all do with more peace and serenity in our lives. That’s the fun of A-to-Z isn’t it – all the different things to explore?